A beautiful Ster Fresian horse named Koning was enjoying the fresh air outside on his human’s property in the United Kingdom. Standing on the other side of the fence was something that quickly caught his eye: cattle! The cattle belonged to the neighbor and they were just as curious about Koning as Koning was about them. Koning walked over to the fence to greet the cattle. Much to his surprise, the cattle weren’t afraid of him. Instead, they lined up against the fence. With his new audience looking on, he decided to show off and give them a little show. Koning started dancing and galloping around in circles as the cattle watched. And we absolutely don’t blame them, because Koning’s dance and gorgeous appearance is definitely show-worthy! Koning then walked over to the cows and even gave a kiss to one of them! It’s so amazing to watch two different species interact in such a gentle way. It’s safe to say that Koning made some new friends! The Friesian horse originated in Friesland, in the Netherlands. They are graceful and nimble for their size, and it’s believed that their ancestors were in great demand as war horses throughout Europe during the Middle Ages since their size allowed them to carry a knight in armor. 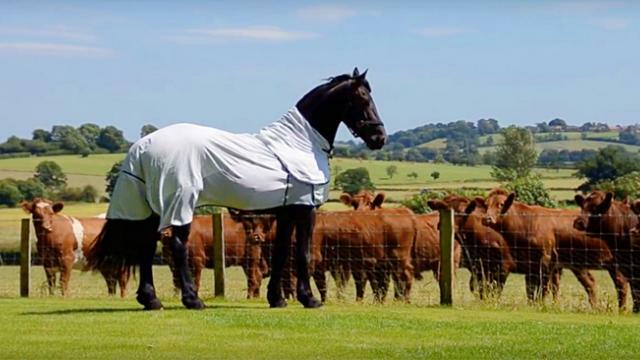 While the Friesian horse was close to extinction in the past, the modern day Friesian is growing in both numbers and popularity. They are also being brought into the field of Dressage, which explains Koning’s galloping and dancing!